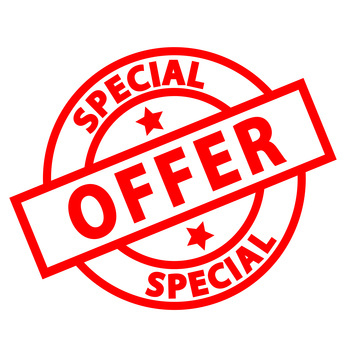 Special offers are a great way of attracting new dental patients. However, in order to stand out from the crowd you must come up with something different from the other dentist specials in your area. In this post we discuss 15 special offers you can use to acquire more dental patients and increase production. A free case evaluation or consultation is a simple but very effective offer. If you are a start-up dental practice and have more time than money, then start offering free consultations to get more new patients. You can also combine this offer with high value procedures like Invisalign braces. This is the most popular discount offer and virtually every other dentist offers some kind of heavily discounted teeth whitening. Some dentists even offer free whitening for life with high value procedures like dental implants. In fact, this offer is best used as a free add-on. This is another overused discount offer that has lost it’s effectiveness simply because every other dentists is offering it. If you are just starting your dental office, you may want to join the crowd but do not expect to get much traction. If you want to grow your patient base for a certain type of treatment procedures eg. emergencies, implants, braces, dentures etc. then you can try offering a discount on specific procedure. This will attract patients who have already been diagnosed and recommended a specific procedure and are now comparison shopping for the best price. Every dental office should have a patient referral program. In order to get more referrals from your existing patients, you can reward them a nice discount on their next dental appointment. Similar to patient referrals, you can give discounts to patients that visit your office in a group. That could be a group of college friends or work colleagues. You can also extend this discount offer to attract families with children. If you run a kids dentistry or accept pediatric cases then January and August present a great opportunity to attract more families kids to your dental practice by offering a back to school offer like free exam and discounted cleaning. This offer will give your office production a nice boost at least twice a year. Is your dental office located near a school, college or university? If the answer is yes then you must test some student discount offers. These offers can be done in collaboration with the school/college or you could create a group discount for students. If your office is located in a retirement destination or a neighborhood dominated by seniors, you can introduce a senior discount aimed at attracting older patients. Is your dental office located near a military base or a neighborhood dominated by retired veterans? You can take advantage of this situation by offering discounts to military vets. Cash flow can be difficult to manage sometimes so what better then encouraging your patients to pay upfront. You can do exactly that by offering a discount on upfront payments. While this may not bring many new patients, it will help improve your cash-flow. Good dental practice management demands that you reward existing patients regularly to improve patient retention. A loyalty discount offer or card is a great way to improve patient retention and encourage repeat visits from long time patients. Another way to improve cash-flow of your dental practice is to introduce an in-house dental plan. In order to encourage more patients to buy your annual dental plan, you can offer large discounts on expensive dental treatments to make them more affordable for your dental plan members. As you can see from the list above, creating special offers is not rocket science. Just a little bit of creativity goes a long way in making your discount offer stand out from the crowd and grab the attention of prospective dental patients. I hope this list will help your imagination going and so you can come up with a great offer to attract more patients to your dental practice.